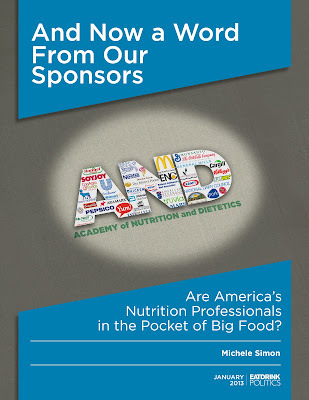 Seldom have I read such a damning report as the one published today by Eat, Drink, Politics' Public Health Lawyer Michele Simon where she painstakingly details the unspeakably cozy relationship between the Academy of Nutrition and Dietetics(AND), America's largest association of nutrition professionals, and the food industry. I honestly can't even begin to do this report justice in a brief blog post. What I found the most striking was the fact that it seems pretty clear that from their own accounting AND doesn't need the food industry's dollars. 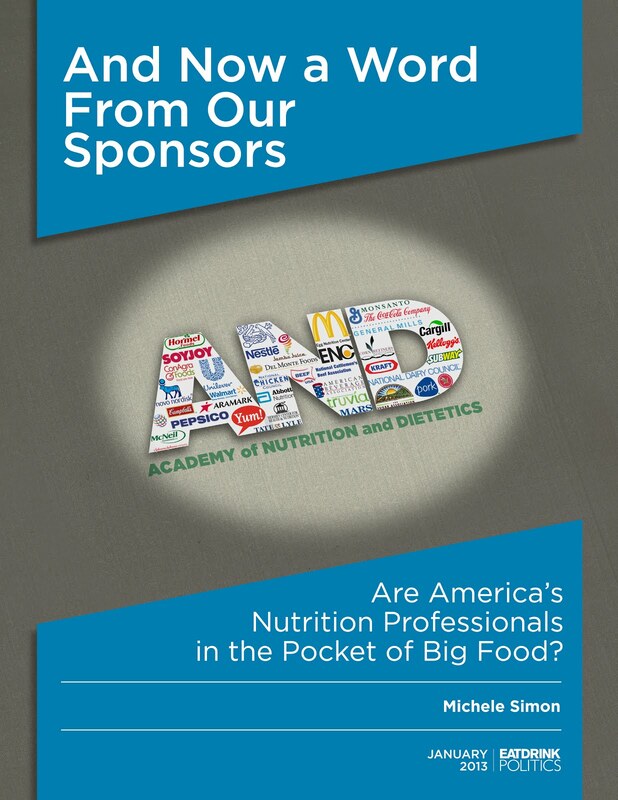 What I mean is that according to Simon's research, corporate sponsorship only generated $1.8 million in revenue last year - a rather paltry sum all things considered, but that paltry sum afforded the food industry unparalleled access to America's dietitians. It provided sponsors with among other things the ability to produce co-branded "educational" materials, access to mailing lists and even the opportunity to provide accredited continuing education (including one course where Coca-Cola taught RDs that there's no evidence of harm to sugar consumption in children). Putting that $1.8 million in some perspective, AND is 74,000 members strong. If AND decided to protect its credibility and divorce itself from corporate sponsorship it could do so by raising the cost of membership by just $24 a year. In fact if AND raised membership by $42 a year it would also offset the food industry's annual contributions to the AND Foundation - a Foundation already flush with cash having a reported value of $17 million, or 6 times AND's reported annual expenses. In a private conversation Simon mentioned to me that there are some who doubt the transparency of AND's accounting and that corporate dollars are much greater than those reported. Of course if that were true, the question to be asked is what, why and how much are they hiding? Alternatively, if the numbers are true, and if AND doesn't truly need the money, the question to be asked is why do they allow their reputation and credibility to be sullied by the food industry? Your guess is as good as mine, and I'd bet at the end of the day the answers to all of those questions are direct or indirect personal pots of gold, power, or influence. "These corporate relationships go deeper than just money, which is what makes them so insidious. What’s really going on is a battle over the role of the food industry in shaping the very discourse of nutrition education and policy. It appears that the old guard” at AND is desperately holding on to the outdated notion that the food industry should have a seat at the table. But that leadership will soon have to make way for the younger generation of RDs who realize that partnering with junk food companies only harms their profession." Truly, if you have any interest at all in the risks of partnerships with the food industry and just how ugly and twisted they can get, take some time and take in this report. It's a must read.